Seek thermal is known for designing high-quality thermal imaging cameras that always impress where functionality is concerned. Their range of thermal cameras is considered to be one of the most advanced thanks to the superior technology used in their construction. The Seek Shot line compete directly with FLIR's C2 and C3 thermal cameras and all of these are under $1,000. Compact: For units, you’re likely to use for hours on end, you want a device that allows for comfortable handling. And if you can carry it around with ease, that would be even better. Seek understands both these concepts and that’s why they made their cameras small & compact. Because of the pocket-sized design, you can quickly slip it into your clothes pocket as you move from one inspection or hunting site to the next. Easy to use: Seek thermal cameras are also known for their simple and intuitive operations. The task of inspecting buildings and detecting energy loss is hard enough. The last thing you need is a device that’s complicated to use during the process. This is why many inspectors prefer the Seek thermal cameras because they’re designed to make their jobs much easier. High performance: Since these cameras utilize advanced thermal imaging technology, you can also expect high performance. Whether you want to detect energy loss or spot overheating issues, these devices will help you get the job done. Affordability: With all the impressive features associated with these thermal cameras, you’d expect to part with a lot of money to own such a camera. Thankfully that’s not the case with the Seek thermal range as these cameras are relatively inexpensive units. From the above, it’s clear why most building professionals would pick the Seek thermal products over the other brands. 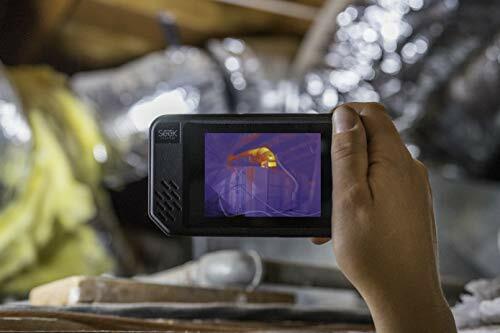 We’ll outline one of the most impressive products to come out of the Seek thermal range; the Seek Shot thermal imaging camera. This pocket-sized device is the one to pick if you’re looking for a high performance and practical unit. 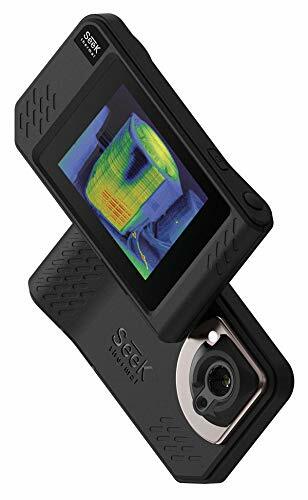 The Seek shot camera is no doubt one of the best thermal cameras from the Seek range thanks to its many useful features. We’ll discuss a few major features below and where they best excel in relation to their benefits. Forget rushing to the office to analyze the gathered data in order to determine the problem. This camera offers you the convenience of not only taking a picture but also editing and analyzing it immediately. This means you’re in a position to make any crucial decisions much quicker than with other thermal cameras. Apart from aiding in fast decision making, this device allows you to create time-saving reports almost immediately. You can input the necessary measurements and information on the device while on site which will save you a lot of time. Another impressive functionality found on the Seek shot thermal camera is SeekFusion. This is Seeks proprietary feature that allows you to detect even the smallest of problems and quickly by overlaying the thermal image on the standard visual image much like FLIR's MSX technology. The SeekFusion functionality coupled with the adjustable blend of visible & thermal images will also speed up the problem detection process. Detecting problems are the first step. 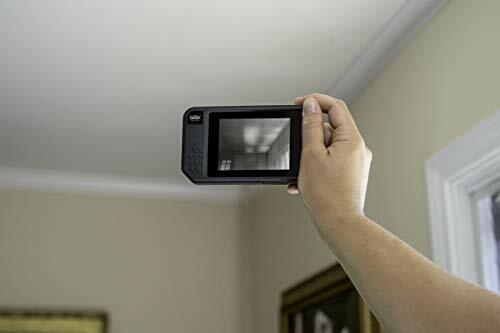 As soon as you gather the necessary information, this thermal camera allows you to share and stream the data to either your SmartPhone or tablet. But note that this functionality can be used when you’re connected to Wi-Fi. Earlier on we mentioned how this Seek shot is one of the best thermal cameras within the Seek range. 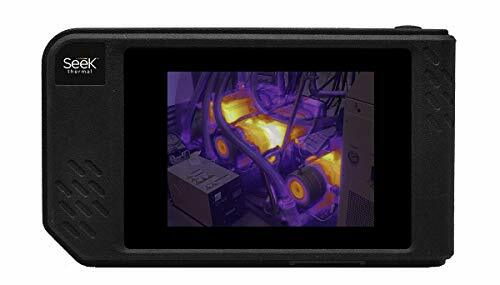 The 640 x 480 visual display coupled with either the 206 x 156 or 320x240 (Seek Pro model) thermal sensor the unit possesses has something to do with that. This device comes with 16 times more resolution compared to other brands in similar price ranges. And you know what they say about a high resolution, right? It equates to more precise and clear images which ultimately make your job much easier. The high resolution means nothing if you can’t view the images easily. This is why Seek made sure its product features a large color touch screen for clear display. Thanks to the large screen, you can easily adjust the necessary thermal analysis tools immediately on the device. This helps you get the job done in record time. All the above features won’t be very useful if the unit doesn’t last long. But you don’t have to worry about longevity with this unit because it has a durable IP-54 rating meaning it’s built to last. The Seek Shot is designed to withstand most harsh elements associated with many site locations. For easier handling, the Seek Shot comes with a built-in tripod mount. This feature allows you to mount the unit which allows for fixed monitoring. Seek Shot vs Seek Shot Pro: What Are the Differences? We’ll quickly point out that you can either opt for the Seek Shot or the Seek Shot Pro. Though similar in more ways than one, there are a few differences between the two as we’ll highlight below. The first difference is the cost. The Seek Shot Pro costs significantly more than the Seek Shot so remember that if you’re working on a budget. With regards to the field of view, note that the Seek Shot has a 36° field of view while the Pro has a 57° field of view. You know which one to pick if you want to have more of the image on the screen. Since the Seek Shot pro costs more than the Seek shot, we’re really not surprised that it has a higher sensor size of 320 x 240. On the other hand, the Seek Shot has a 206 x 156 sensor size. As a result, image clarity is definitely sharper with the Seek Shot Pro model. Seek Shot vs FLIR C2: What are the Similarities and Differences? Both the Seek Shot and FIR C2 serve the same purpose; to conduct thermal inspections. As a result, they offer the same benefits and are similar in a number of areas. But though they share similarities, there are a few differences that we’re going to outline below. After that, we’ll share which one we feel is best. We’ll start off with the design. Both the Seek Shot and FLIR C2 are handheld devices so they feature a compact design making them both easy to handle. Here is another thing they have in common; the two units are available at the same price. The first notable difference between the two has to be the thermal resolution. The FLIR C2 thermal camera has an 80 x 60 thermal sensor but the Seek Shot has a larger 206 x 156 thermal sensor. This means you’ll enjoy a higher quality thermal image if you use the Seek Shot compared to its counterpart. FLIR compensates for this with their MSX image enhancement which they have refined over the years. This is where the FLIR C2 is a step ahead because it utilizes advanced MSX technology which FLIR has perfected overs the years and the MSX compensates for the C2 and C3's lower thermal resolution. FLIR's MSX technology overlays the thermal image onto a standard digital image. Seek has developed their own form of this which they call SeekFusion. The FLIR C2 has a wider field of view of 45° compared to the Seek Shot’s 36°. This means you’re able to view a larger area when using the FLIR camera. The thermal cameras have different viewing angles. The user-facing display and camera of the FLIR C2 are both located at the back of the device - much like the design of a SmartPhone. But the Seek Shot’s camera is located on the top part of the unit meaning the user would have to look down at the display while using the device. As mentioned earlier you can stream and share data from the Seek Shot to any mobile device. This also makes it easier to monitor the data and get input from other inspectors if necessary. Unfortunately, you can’t do the same with the FLIR C2. You will have to upgrade to FLIR C3 to get a Wifi feature. They’re not designed to stream any videos using Wi-Fi. With the FLIR C2, you can only edit & analyze the images using the FLIR tools software and that’s about it. The Seek Shot does not have report generation tools like the C2 and C3's built in reporting tools although you can use third party tools easily with the Seek. If you will be using your thermal camera to generate reports on a daily basis and already use FLIR's report generation tools then the Seek Shot might not be the best choice as you will need to use different reporting software. Flir C2 and C3 can provide up to 2 hours of battery life. Seek Shot and Seek ShotPro can last up to 4 hours. With that said, which one would you pick: The Seek Shot or the FLIR C2 or C3? You’ll enjoy more or less the same benefits by using either of the two units. But if we were to pick one based on the above information, we’d go with the Seek Shot Pro simply because it offers better image quality and you can connect it to Wi-Fi for added convenience. The only downside is that the Seek Shot does not have built in reporting software like the C2 and C3 have. Leave your thoughts below and help others who are still shopping around.